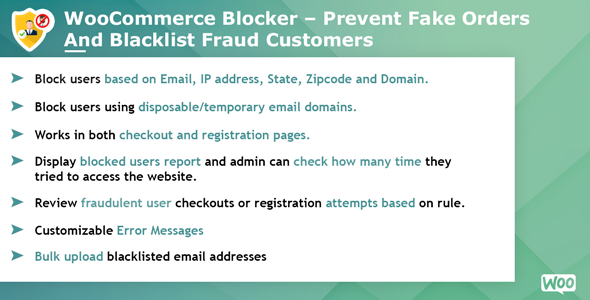 Woocommerce Blocker - Prevent fake orders and Blacklist fraud customers Plugin will Prevent fake orders and Blacklist fraud customers of your store. The plugin allows your shop to block or blacklist certain specific visitors via IP address, state, and Zip code. This plugin can be used to refuse orders from specific users, based on customize blacklisting criteria. You could specify a list of Email Addresses, IP address, State, Zip-code and Domain names, that will be blacklisted. When a user will try to place an order or register using one of the blacklisted email, domain name, IP ect.. the checkout or account will be interrupted and the user will be notified of the reason why the operation was blocked. Additionally, an admin can get the detail report of genuine block user "who try to buy products more than one time" and contact them to resolve an issue. Block Specific user order With this features you can block specific user. it is based on different blacklisting criteria as below. Add custom Message for blacklisted user With this features you can add custom message for blacklisted user. This message will display when blacked listed rule will apply as per below list of criteria. Block user based on Email, IP, State, Zipcode, and Domain. Block user from web centralize data using API. Ability to review fraudulent checkouts OR registration attempts based on rule. Works in both checkout and registration pages. Display standard WooCommerce notices, error messages can be customized via back-end settings. Display blocked users report and admin can check how many time they tried to website. Easy to use interface to create and review blacklist rules. It Increses the risk of multiple time refunds for the vendor. It will increases your bad image in your bank or blacklists our company account. It will damage your brand value. - New features:Plugin is supported 3 to 7 digit zip code.